SkyLaw client Cronos Group Inc. became the first cannabis company ever to list on a major U.S. stock exchange when it announced that its shares are now trading on the Nasdaq under the ticker symbol “CRON”. While cannabis remains illegal under U.S. Federal laws, U.S. investors can buy shares of foreign companies like Cronos that operate legally in their respective countries and have no operations in the U.S.
“This up listing to Nasdaq is a major corporate milestone and reflects the significant progress we have made in strengthening our corporate governance and expanding our global footprint,” said Mike Gorenstein, CEO of Cronos Group. In addition to owning two licensed producers in Canada, Cronos has multiple international cannabis production and distribution platforms, including in Israel and Australia. Cronos also recently announced a joint venture with U.S. cannabis giant MedMen Enterprises to bring America’s most recognized cannabis brand to Canada. Cronos has been a client of SkyLaw since December 2015 and we congratulate the hard-working team at Cronos on all of their achievements. More scrutiny on shareholders. Further to the Cannabis Act’s provision for the Minister to require “financial information” about an applicant, including information about its shareholders, Health Canada is mulling the best way to allow for scrutiny of shareholders of corporate applicants. This concern is driven by a persistent worry that organized crime may involve itself in the new regulated cannabis industry through investments in licensed entities. The government’s original proposal had been to require security clearance for shareholders who held at least 25% of any applicant; however, the government has realized that this could be easy to undermine. Health Canada is now considering other screening methods, including a requirement that applicants submit information about their investors –which would be kept on file and taken into account when licences were being issued or up for renewal if public safety concerns were raised. Health Canada is also considering requiring licensees to regularly report financial information to help the government identify suspicious financial relationships or arrangements that may warrant regulatory action. Fresh genetics. Health Canada is considering how to enable the introduction of new plant genetics into the legal system. Currently, the ACMPR only permit licensed producers to purchase cannabis starting materials from other licensed producers, with few exceptions – giving the black market a big edge on diversity of strains. Although accessing strains from outside the regulated market could be a boon to LPs, Health Canada noted that the regulations would need to ensure that organized crime would not benefit from criminal activity with cannabis (for example, by selling genetics to licensed entities). Outdoor grows. Citing broad support for outdoor cultivation of cannabis, Health Canada appears prepared to allow this, despite the possibility of greater risk of theft and diversion. Physical security measures, such as fences and video surveillance, would still apply. Further consideration is being given to how odour control and good production practices could be tailored to outdoor grows. Micro vs. standard licences. The government has previously proposed “standard” and “micro” licences for cultivation and processing. The government’s vision for “micro” licences is that they will facilitate the participation of small-scale growers and processors in the legal cannabis industry. However, it was unclear what the maximum thresholds would be for “micro” licensees. A micro-cultivation licence is proposed to cover 200 square metres of canopy – approximately 2,150 square feet. No limits on height or production capacity are contemplated for now. Health Canada offered a diagram of what 200 square metres looks like – and used a hockey rink for scale. So Canadian! A micro-processing licence is proposed to allow for the processing of up to 600 kilograms of dried cannabis per year – designed to correlate to the estimated annual output of a single micro-cultivation licence. Non-violent, lower-risk criminal records may pass security clearance. Citing support from “a strong majority” of respondents for this idea, Health Canada is considering allowing individuals with histories of non-violent, lower-risk criminal activity who are not associated with organized crime to obtain security clearance and participate in the legal cannabis industry. Health Canada noted that many respondents had argued that allowing such individuals to participate in the legal industry could be a step towards displacing the illegal market and lowering barriers for racilized or marginalized communities who may have had more frequent encounters with law enforcement and the criminal justice system. Detailed packaging and labelling requirements. Plain is the order of the day, according to Health Canada’s packaging and labelling proposals. Label and package backgrounds would be opaque or translucent and must be a single uniform colour (excluding anything metallic or fluorescent), without coating, texture, foil, or cut-outs. Branding – including a logo or company name – would be subject to size limits. 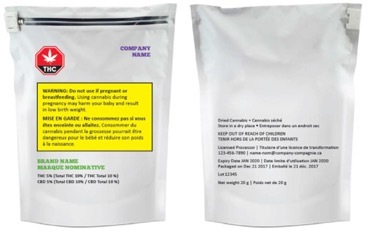 An informational document developed by Health Canada, containing health and safety information about cannabis, including precautions and directions for use, would be provided to consumers with every packaged product. Medical cannabis will stay – for now. Health Canada noted support among respondents for its proposed regulatory approach to continue the medical cannabis program as distinct from the recreational program. It sounds like the ACMPR would effectively be turned into regulations to the Cannabis Act. However, adjustments may be coming: the government may make it easier for patients to transfer their medical documents to a different LP, among other changes. The government, which is only obligated by law to provide “reasonable access” to cannabis for sick people, will re-evaluate the need for a separate medical cannabis system within five years of the Cannabis Act coming into force. The taxation of medical cannabis may be an evolving subject. Health Canada indicated that most respondents did not support applying excise taxes to medical cannabis, and noted that the 2018 Federal budget provided for excise tax exemptions for low-THC cannabis oils of the basis of their “potentially therapeutic role”. Pharmaceutical products derived from cannabis will also be exempt from excise taxes. I would not be surprised to see a continuing policy evolution here as research into the medical effects of each of CBD, THC, and other cannabinoids continues. Introducing the Ontario Cannabis Store – Safely. The LCBO explained that the brand is designed to convey a safe, simple, and approachable environment for consumers. It’s hard to argue with the “safe” point. Even the wittiest Twitter users could only come up with “The Ox” as a nickname. The LCBO also revealed the inaugural board of directors of its cannabis subsidiary, the Ontario Canabis Retail Corporation. The five directors have professional backgrounds in mental health care, medicine, municipal law, human resources and of course, the LCBO. The logo is one of the first government forays into recreational cannabis branding in the shadow of extensive promotional restrictions in the draft Cannabis Act. The Act prohibits any promotion of cannabis that links it with “a positive or negative emotion about or image of, a way of life such as one that includes glamour, recreation, excitement, vitality, risk or daring”. While the simplicity of the OCS branding is undeniable, public reaction has featured plenty of emotion, especially when it was revealed that the LCBO expects the total cost of all brand development related to the OCS to be $650,000. Health Canada recently introduced some important changes to physical security requirements for licensed producers. Stating that it has not had any cases of diversion of cannabis to the illegal market since June 2013, the regulator announced that LPs will no longer be required to meet the vault and storage requirements outlined in the Directive on Physical Security Requirements for Controlled Substances. The “secure area” concept sounds a lot like a vault, but there are important distinctions. While the requirements for a “secure area” sound like they could be met by little more than a locked room with cameras, an alarm, and a passcode entry system, vaults built according to the Directive had to have characteristics tied to the value of product they contained, and could often become a six-figure expense for applicants. Without a doubt, this policy change will reduce cost barriers for applicants who have not yet constructed their production facility. For everyone who has already invested in expensive vaults, however, this change could leave the bitter taste of money unnecessarily spent. First Production-Only Licence issued: Congratulations to CannMart Inc. for scoring the first-ever “production licence” – an ACMPR licence for only packaging, labelling, and associated product testing. The production licence is the third variation of licence type identified by Health Canada on its website, and could offer the potential for a more streamlined licensing process for applicants which don’t want to be involved in cultivation. Province of Broken Hearts: Home to 100 of 268 rejected applications, British Columbia leads the country in rejected ACMPR applications, according to data released by Health Canada. Reasons for such rejections were not provided, but the security clearance process is known to be strict, and the government has made no secret of its desire to rid Canada’s cannabis scene of black and grey markets. Chief Ganja Officer: Jamaica got its first legal medical cannabis dispensary when Kaya Farms opened on Saturday. The company even has a Chief Ganja Officer, my favourite officer title yet. Jamaica’s Cannabis Licensing Authority was established in 2015 to license and regulate the island’s “ganja and hemp industries” within a closed-loop system (licensed entities may only transact with other licensees). Permitted use of the plant is strictly medical and scientific, however. The Authority has had to correct at least one article proclaiming that Kaya would provide recreational ganja to locals and tourists. And Canadians might not have access to Jamaican ganja anytime soon: import and export of cannabis is prohibited under the island’s laws. The Authority has pointed tointernational treaty obligations and correspondent banking as important factors in ruling out international cannabis trade and a domestic recreational regime for the time being. “Correspondent banking” is the means by which domestic banks work with foreign correspondent banks to facilitate foreign exchange transactions that are important for tourism and remittance of funds from friends and family overseas. Jamaica’s concern is that foreign banks may not maintain services with local banks if they service clients who obtain funds from activities the foreign bank views as illegal. The situation is another reminder of the important role that banks play in the unfolding story of cannabis legalization.